Approximately 12km (7.5 miles) south of Dublin lies the coastal town of Dun Laoghaire. Think harbour, piers, colourful doors and small town living; this is pretty much Dun Laoghaire. The town is an easy journey from Dublin by train or even bus, making it an ideal half day trip from Dublin. 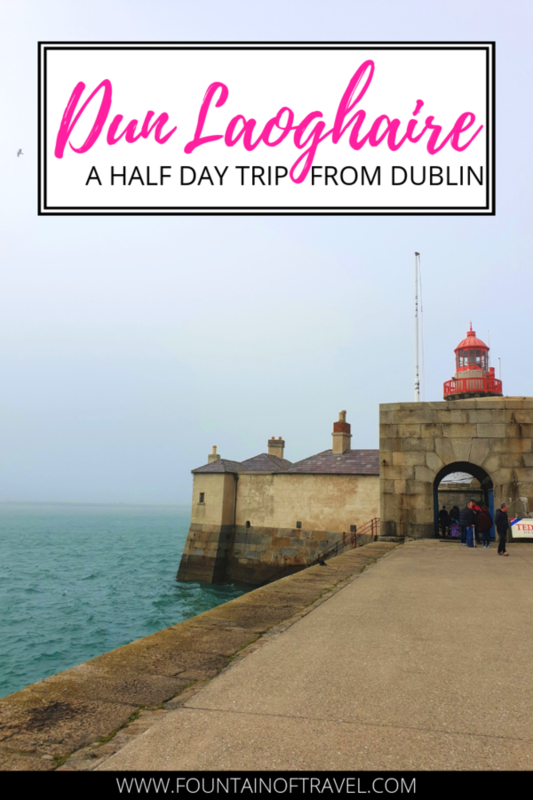 If you want to really chill out you could also make Dun Laoghaire a full day trip from Dublin. 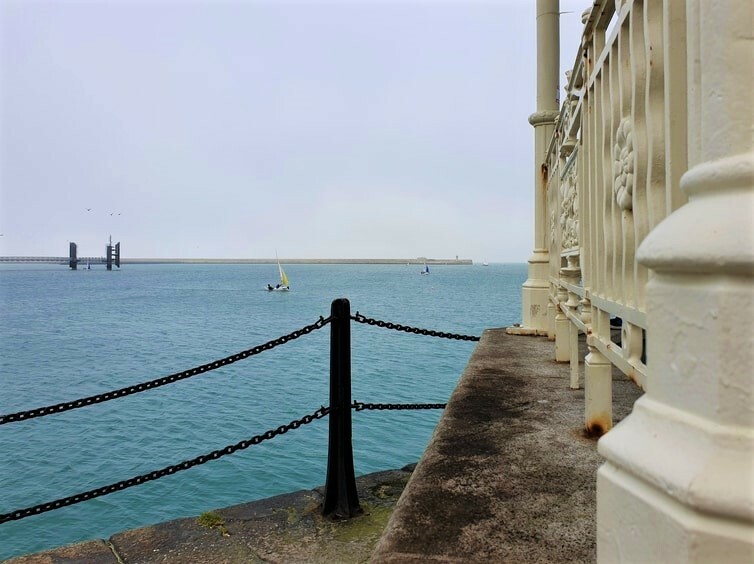 The main appeal of Dun Laoghaire is the slower pace compared to the busy Dublin town centre along with the ice-cream-in-your-windswept-hair feeling of being on the coast. Read on for suggestions on how to spend your half day trip from Dublin. Also, I know what you’re thinking. It’s pronounced Dun Leery. Well, I can definitely tell you when not to visit the town. I went to Dun Laoghaire in February and it was an incredibly cold experience. Keep in mind that Dublin can be cold in February; add the windchill in Dun Laoghaire and you’re in for a cold treat if you visit in winter. Instead, I would recommend a summer visit. You could even have ice cream without the risk of reaching sub-zero temperatures from the inside and out. Just imagine walking down the pier in (hopefully) sunny weather with a cool breeze from the sea and an ice cream in your hand whilst the seagulls circle above. Sounds better than clattering teeth and ice cold hands, right? Summer is the way forward guys. To help plan your travel in and around Dublin I would recommend the free mobile app Journey Planner by the National Transport Authority (green logo). It was a massive help when trying to work out what bus or train to take in Dublin. As mentioned earlier, the distance from Dublin to Dun Laoghaire is a mere 12km. I travelled by bus to Dun Laoghaire but you could just as easily take the train. Simply grab the DART from Pearse Station bound for Greystones or Bray Daly and get off at Dun Laoghaire. The journey takes between 31 to 39 minutes and a one-way ticket will set you back 3.30 euros, if paying by cash. If you’re based around Temple Bar it’s really easy to catch a bus to Dun Laoghaire. Simply walk down to Nassau Street and take the 7 towards Bride’s Glen, 7A towards Loughlinstown Wood Estate or 46A towards University College Dublin. Tickets are 3.30 euros one-way, if paying by cash, and the journey takes between 30 to 40 minutes. Get off just before the train station in Dun Laoghaire. If you opt for the bus, make sure you have exact change as the bus drivers don’t carry money. Drop your change in the metal box in front of the driver and keep your fingers crossed you’ve got a friendly bus driver. Mine gave me a diva flick with his hand and rolled his eyes. If only I had so much sass on a Sunday morning. Top tip – on your way back to Dublin you need to catch the bus from Lower George Street, not the train station. Dun Laoghaire is most famous for its harbour, which took 42 years to construct and was finalised in 1859. 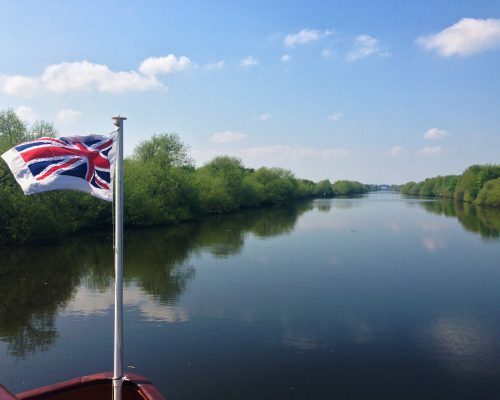 Originally constructed to provide a safe haven for ships, especially after a tragic incident in 1807 where almost 400 lives were lost, it’s today a popular visitor attraction. The harbour consists of the West and East Pier, with the East being more accessible for walks. Your train and bus will stop pretty much next to the Dun Laoghaire harbour and I suggest that you start your walk by visiting the Queen Victoria Fountain. Apart from simply being a beautiful construction, it’s got a freakin winged horse statue. I believe winged horse is the correct term, however, I like to think of it as a unicorn. 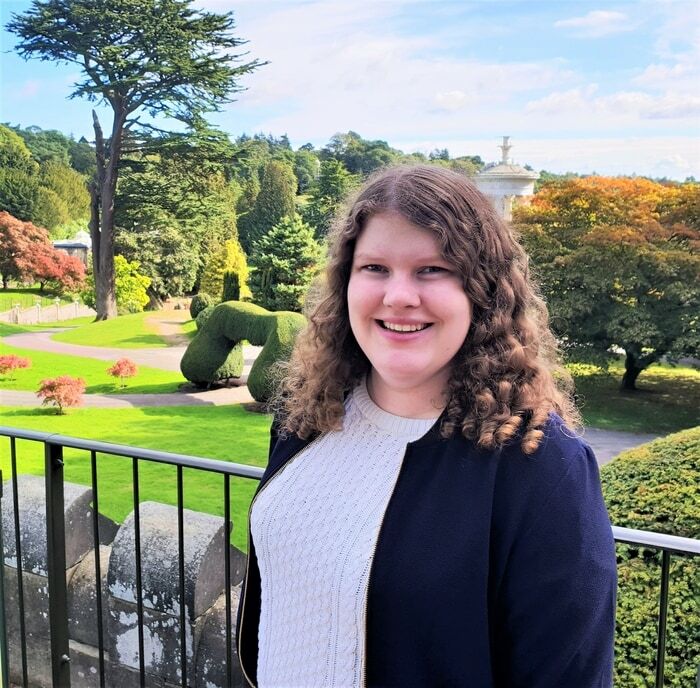 The fountain was built to commemorate the visit of Queen Victoria in 1900 but was severely vandalised in the 80s and then restored. An interesting first stop on your walk basically. 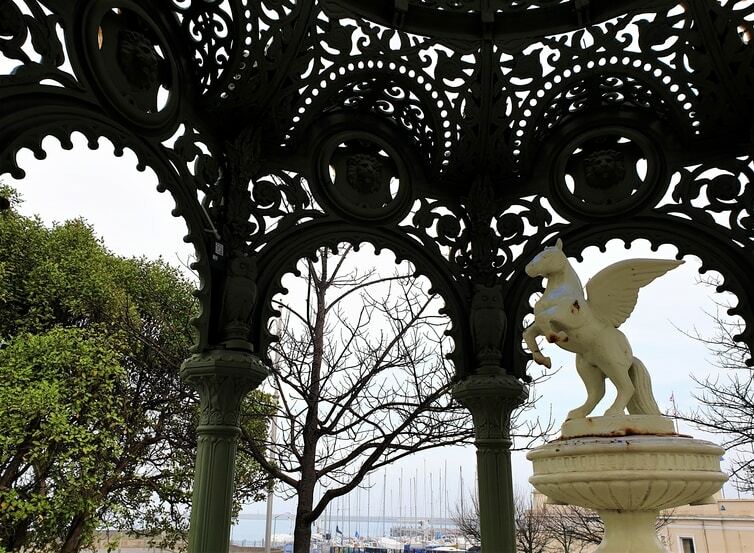 Once you’ve seen the Queen Victoria Fountain, head over to the East Pier and go for a leisurely stroll. At the end of the pier, you’ll find a lighthouse where soldiers were stationed back in the day. Nowadays, you can buy a snack (ice cream!) and admire the views. The area is famous for fish and chips but I can’t comment on the quality as I didn’t try it myself. Along the pier you’ll see plenty of sailboats (I can confirm that it’s very stress-inducing to watch them in strong winds and fog) and the entire area has strong Wes Anderson-vibes. The East pier is a 2.6 km walk in total so make sure you allocate enough time for a relaxed stroll. To make the most of your half day trip to Dun Laoghaire I recommend that you plan your visit on a Sunday. This is all in the name of food, as local artisans put up a food market in People’s Park every Sunday. 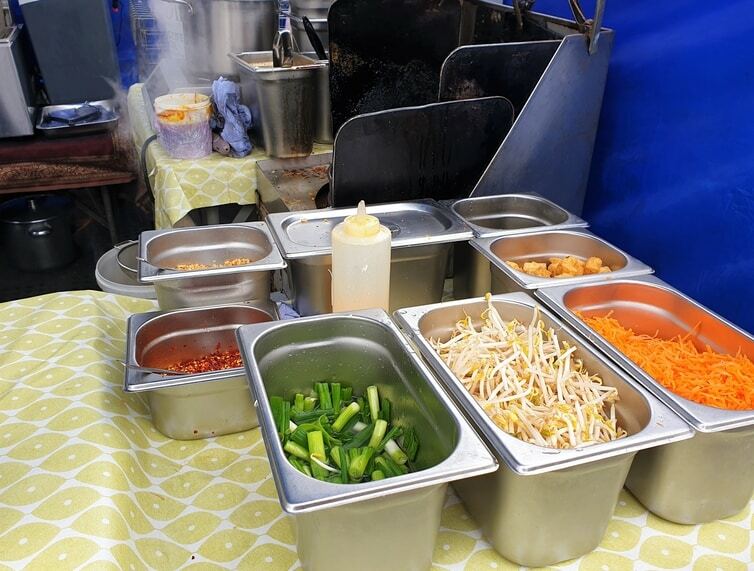 I tried the Thai food stall where they cooked your meal fresh to order and I would definitely recommend the pad thai. 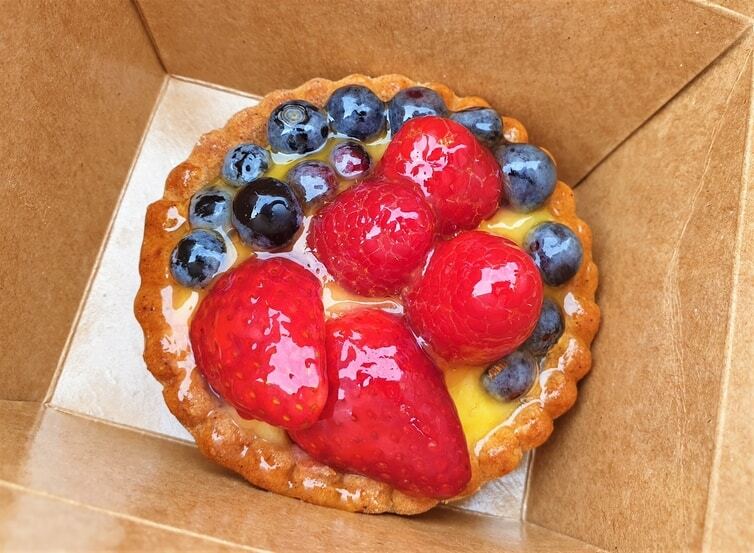 The highlight of the day, however, was the French patisserie stall, where I had the glazed piece of wonder below. Omg, so tasty. If neither of these options take your fancy, there is everything from Korean, Spanish, Japanese, pizza and crepes to freshly baked bread and fishmongers. I can guarantee that you won’t go home hungry. 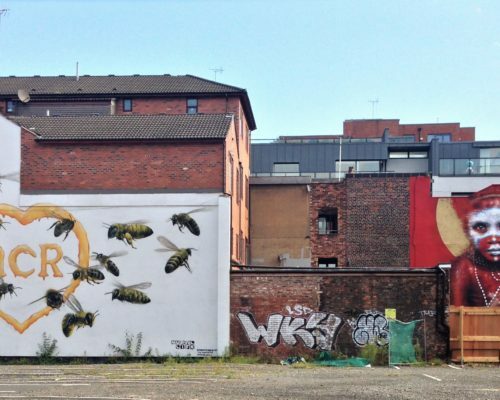 Before you leave, have a look at the artwork for sale at the edge of the park. I bought a cute postcard from one of the traders but they have some really lovely larger pieces. 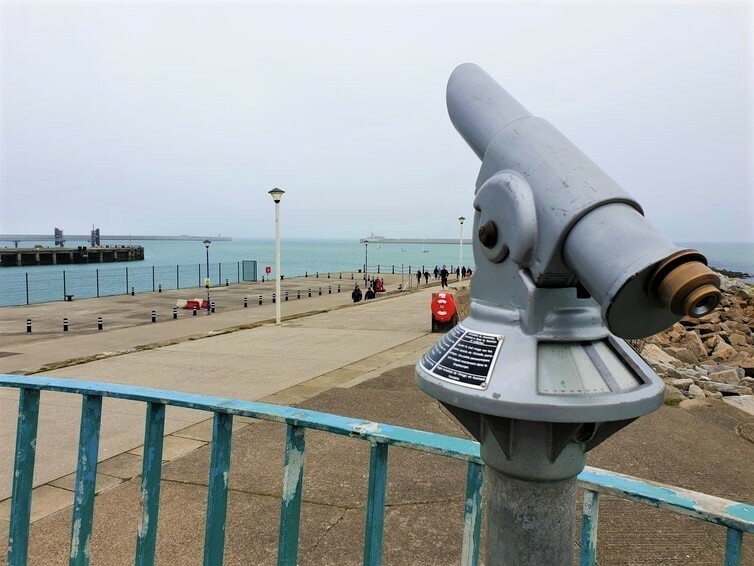 Finish off your half day trip from Dublin by going for a short walk through the city centre of Dun Laoghaire. Make sure you walk down side streets so you don’t miss the cute coloured doors of residential houses. 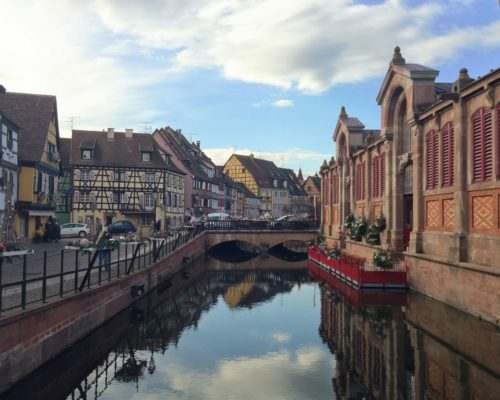 If you find that half a day isn’t enough to satisfy your lust for that coastal lifestyle, then the below are a few extras that you could visit. Disclaimer – I only visited the library briefly and did not visit the Maritime Museum as I’m not very interested in maritime history (probably because I’m terrified of water). However, they are both well-known attractions in Dun Laoghaire and when it comes to the marine museum, well, you are on the coast so when in Rome and all that. The proper name of Dun Laoghaire’s library is dlr LexIcon and the building is a rather new addition to the Dun Laoghaire skyline. Opened in 2015 the venue boasts just not a library, but also theatre, exhibition and performance spaces. I suggest that you check the events website to see if there are any events during your visit. Finally, the building offers great views of the harbour, so head up to the 4th or 5th floor to admire the sight. If you can think of nothing more exciting than salty water and strong winds, then the Dun Laoghaire Maritime Museum could be right up your street (ship). Although I’m not much of a seadog even I will admit that the building housing the museum is impressive. The museum is located in Mariner’s Church; a 180-year old building intended to be a place of worship for seafarers. Entrance is 6 euros for adults and guides are there to take you through the museum and maritime history. That’s it folks! Dun Laoghaire isn’t a massive town (26,000 inhabitants) but definitely worth the half day trip from Dublin. 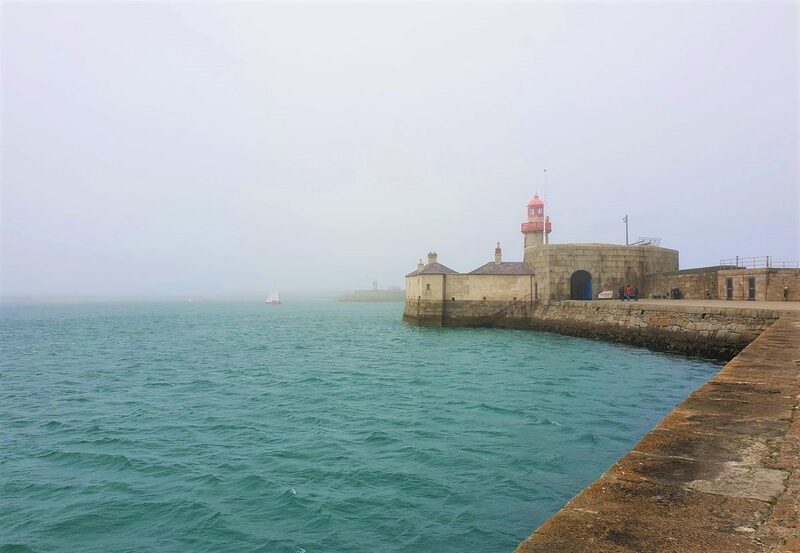 Despite the freezing cold (and fog as evident in the pictures) I really enjoyed the beauty of Dun Laoghaire’s harbour and quaint residential houses. If you want a break from the hustle and bustle of Dublin city centre, then Dun Laoghaire should definitely be at the top of your itinerary! 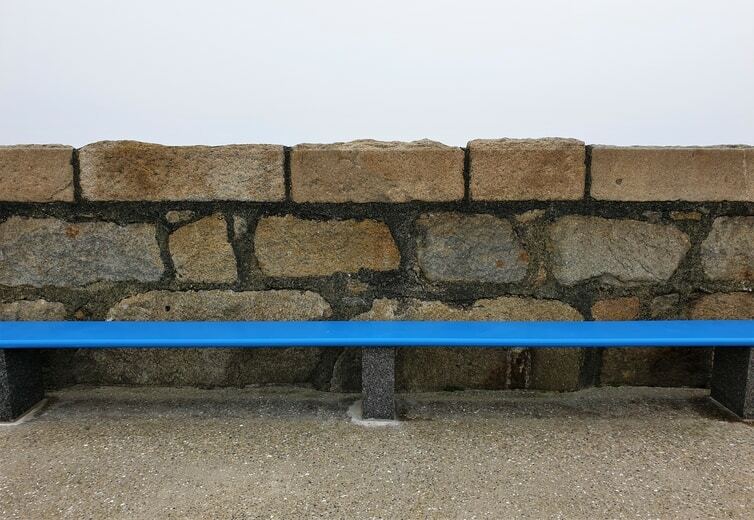 Have you ever visited or even heard of Dun Laoghaire?